I started planning the next Milton book as I was putting the finishing touches to the last one, Redeemer. I’d been planning to write something based around the case of Alexander Litvinenko, the ex-Russian spy who was allegedly poisoned by the SVR in 2006. You might remember that case: his tea was laced with radioactive polonium. I had in mind a situation where Milton – in a flashback to the time when he was still working for Group 15 – investigated a case like that and then exacted revenge on the guilty parties. It felt interesting and fresh and I knew that it would be a book that I would enjoy writing. Fast forward to a Sunday in March of this year. I was in the office where I’m writing this post and had spent a couple of hours on the new book. Sergei and Yulia Skripal were discovered on a park bench two minutes away from me. The early suggestion was that they were drug addicts who had overdosed on fentanyl. 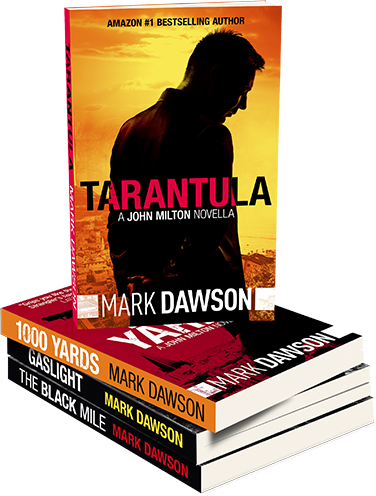 That was quickly proven to be inaccurate, and, over the course of the next few weeks and months, I found myself writing an spy novel whilst a similar story – involving espionage, assassinations and international intrigue – unfolded, in real time, around me. It would have been completely impossible not to have been influenced by the events in my home town. The real-life story has evolved since the Skripals were found. A pub and restaurant have been cordoned off. The park where I walk most days – and where my daughter had her school picnic – has been closed. Soldiers in Hazmat suits have been walking our beautiful medieval streets. And, even as I’ve been writing this post, another site – literally thirty seconds away from here – has been cordoned off so that police can search for the container of Novichok that poisoned both the Skripals and the two civilians who came across it later. The new Milton novel is called Sleepers and it is available to preorder on Amazon right now. If you want to check it out, click here. (All of the other retailers will have the book available for preorder in the next week or two). The action takes place in a town on the east coast of the UK, and features Milton just before the events of The Cleaner. Accordingly, you can expect to see appearances from some of your favourite characters from the series (including a couple whom I know readers love to hate). Writing it has been difficult, and I’ve been very conscious of treating events with sensitivity and respect. I’ll be donating some of the proceeds from the book to local charities in an attempt to help the recovery process. One final thing: I was contacted by BBC Breakfast News to go on national TV to discuss the investigation, and how it has influenced my writing. You can watch that clip on YouTube by clicking here.